The 2008+ Kawasaki Teryx is factory equipped with a 749cc four stroke engine. They also come with 26”tires,7.5” of front suspension travel and 7.2” of rear suspension travel and 11.2” of ground clearance. Xtreme Products’ 2” lift creates room for up to 30.0” tires. That combination provides approximately 4.0” of lift height and 15.2” of total ground clearance. Get the most out of your Teryx with the Xtreme Products 2" lift today. (Relocates top of Front and Rear shocks). . Installation was pretty straightforward. All parts were accounted for. Directions were copies, and the pictures were almost worthless, but there are written instructions. We're not building a rocket ship, so it wasn't too hard to figure out where everything went. 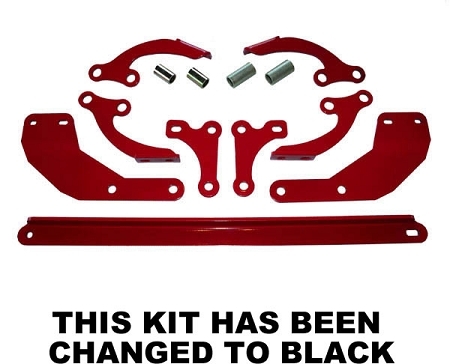 The kit I received was powder coated black, not red like the picture. Actually prefer the black, it's less noticeable. All but the front square u-bolts seemed to be well constructed. The front u-bolts are thin and made of cheap steal. There have been reports of these bolts shearing if you take a hard hit on one wheel or the other. If I had to do it over, I would have asked Xtreme for an extra set of front u-bolts, drilled out the plates, and added them for extra strength. We ride hard. Time will tell how they hold up. I didn't measure before installation, but lift was very noticeable. Other than the front u-bolts and the hard to see pics in the directions, pretty happy with the kit so far. ps. Buy and use blue Loctite on all nuts! YOU JUST CANNOT BEAT THE PROFESSIONALISM OF YOUR STAFF. AN EXTREMELY AWESOME EXPERIENCE DEALING WITH YOU GUYS.LOOK FORWARD IN FUTURE PURCHASES. THANKS,MATT. Q: Will this kit fit my 2016 teryx4? A: The manufacturer does not list the 2016 model as an option for this kit. Unfortunately I don't think it will fit.